I am Full Professor in the Faculty of Mathematics at the Complutense University of Madrid. I received my Ph. D. degree in Mathematics from Complutense University of Madrid in 1976. I have been Head of Departement of "Estadística e I. O." of the Facultad de Ciencias Matemáticas de la Universidad Complutense de Madrid, since May of 2010 until October of 2012. 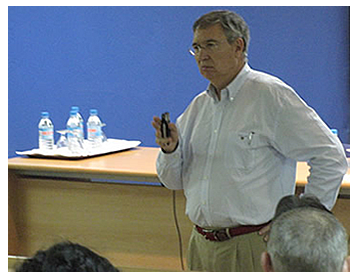 I am the President of the "Sociedad de Historia de la Estadística y la Probabilidad de España" (AHEPE) since August of 2009. I have published research papers in the following journals: Test; Comptes Rendus Academie Sciences Paris; Communication in Statistics & Theory and Methods; Statistics and Probability Letters; Journal of Multivariate Analysis; Revista de la Real Academia de Ciencias Exactas, Fisicas y Naturales; Estadística Española; Revista Matemática Complutense; Journal of Statistical Computation and Simulation; Statistics; Expert Systems with Applications and Information Sciences. I have been referee of Annals of Statistics; Journal of the Royal Statistical Society; The American Statistician Journal of Multivariate Analysis; Statistics; Journal of Statistical Planning and Inference; Test; Revista de la Real Academia de Ciencias Exactas, Fisicas y Naturales; Questió; Estadística Española and Empiria.